Depending on the type of user, they will either be allocated their password in Password Safe or the login will be carried out using access data for the domain. How the user logs in also differs according to the type of user. Local users are those users that were directly created in Password Safe. These users must be directly assigned a password when they are created. If local users are migrated from older versions, they receive a randomly generated password that is sent to them via email. These users must also be assigned a password in Password Safe. A new password will also be issued via email for these users in the case of a possible migration. Various rights are required in order to issue or change user passwords. One prerequisite is the user right Can display organisational structure module. Read and write rights for the user are also required. Finally, membership of the user is required. Normally, the user themselves and the user who created or imported the user have the right to change their password. As already explained, local users are directly assigned their initial password when the user is created. The situation is different for users that are imported in end-to-end mode. They do not possess a password directly after the import and can thus not log in. It is thus necessary to assign passwords after the import. The passwords can be directly assigned or changed via the ribbon. Naturally, it is also possible to select multiple users if e.g. several imported users should be assigned the same password. Even if several users receive the same initial password, it is sensible to force them to change it to an individual password. There is a corresponding option for this purpose. In the case of local users, this can be activated during the creation of the user. In the case of users in end-to-end mode, this option is directly activated during import for security reasons. This option is automatically deactivated after the user has successfully logged in and changed the password. To guarantee that passwords are sufficiently strong, it is recommended that corresponding “password rules”:https://help.passwordsafe.de/v8/1/en/topic/passwortrichtlinien are created. It is especially important to ensure here that user names are excluded. The password rule then still needs to be defined as a “user password rule”:https://help.passwordsafe.de/v8/1/en/topic/administration#standardrichtlinie. The process for logging into the database differs depending on the type of user. 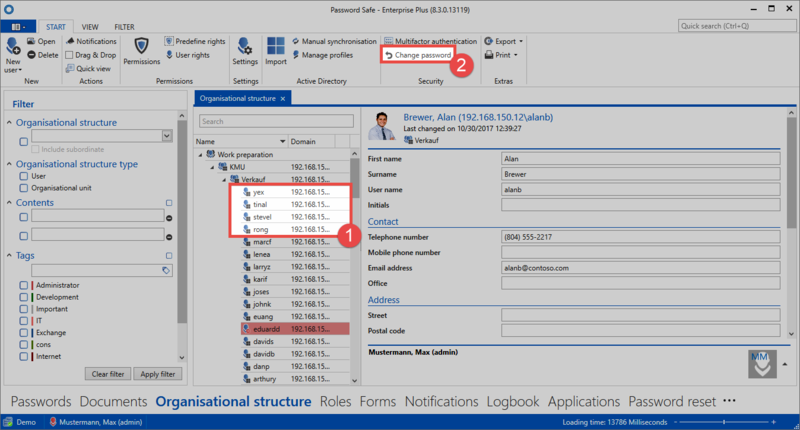 Local users simply log in using their user name and the assigned password. 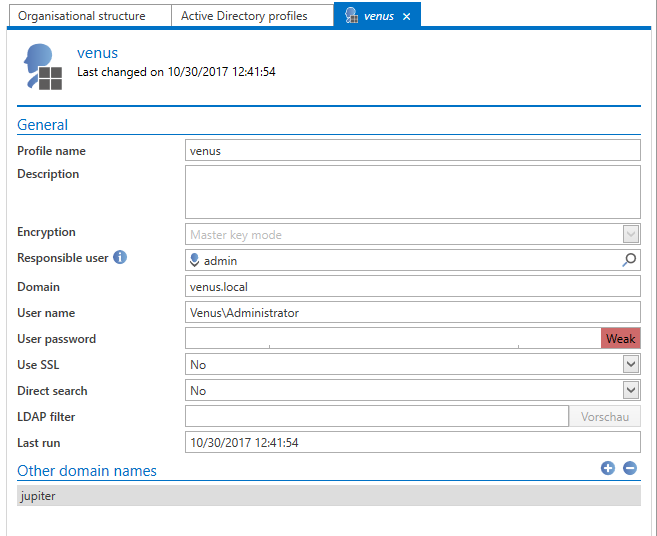 The name of the domain must be entered as it is configured in the AD profile under Domains. The option Other domain names can be used to save other forms of the domain name.